Just regular folks. : Home from Japan, off to bike, Dresden plate. Vince is boarding his flight in Japan right now! He'll be home in the morning. I did a terrible thing and I bought him all his favorite processed food items - hot pockets, kraft mac & cheese, chicken tenders and (gasp!) ramen. Jeremy is leaving right after Vince arrives to go on his week long bike trip; we are driving two cars to the airport so Jeremy can leave straightaway from the arrivals gate area & baggage claim. I have photos of all the bike prep, but I'm too lazy right now to upload. Edda is having a great summer, Aurora, her counselor at camp, is awesome and will be Edda's one-on-one next session as well. I haven't seen Edda so happy during summer in a long time. 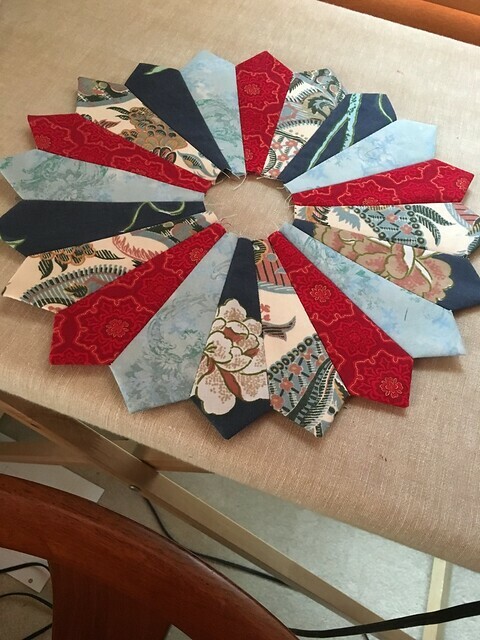 I made a Dresden plate for my next quilt!